The NVMRC Forcefield Trap is a Physical weapon. This trap generates a force field tough enough to hold even the strongest mice within. Once trapped, the mouse is harmlessly incapacitated with 100% organic sleeping gas and relocated to a mouse reservation. The NVMRC Forcefield Trap can be purchased for 256,000 gold from the Town of Gnawnia and King's Gauntlet Trapsmiths. It refunds for 46,155 gold at the same locations. It can also be purchased from the Town of Digby for 243,580 gold, where it refunds for 43,845 gold. 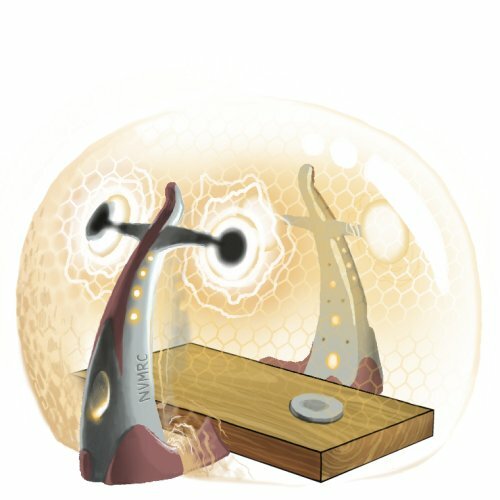 28 July 2008: The NVMRC Forcefield Trap was introduced. The NVMRC Forcefield Trap was named after the Non-Violent Mouse Removal Charity (NVMRC) group which championed the belief that mice, both violent and non-violent, should be caught through non-lethal methods. The group is no longer in existence. This page was last edited on 13 January 2019, at 13:24.